Because authors put their work out there for anyone to see, they receive a lot of criticism—some helpful and some not. What methods are there for developing a thick skin and, instead of getting offended, using the criticism to your advantage? How can you know if you should take criticism to heart and actually change you novel? Here are some tricks and tips. Keep in mind that people may not mean to hurt you with their comments. A lot of people don't understand the work and effort that goes into creating a book and may not realize that they're being insensitive. Many people are genuinely trying to help you with their comments—would you want someone to tell you about the broccoli in your teeth, or would you rather walk around with it stuck in there all day? Remember that you can't please everyone! There will always be someone who doesn't like your book, or who was even offended by it. Criticism is inevitable. If your target audience likes your book, then you're doing a great job. Take a look at the negative reviews on well-received, bestselling books in your genre. Even these great books have been criticized! When you see a negative comment, don't react right away. Take a deep breath and try to see the feedback from a more objective perspective. Try to see it as a way to improve rather than a personal attack. Go read some positive reviews on your book to lift your spirits. If you can't develop that thick skin, try venting about it to a friend (not in public on social media! ), or writing down your frustrations in a journal, and then let go of the hurt and anger. Life goes on. Aside from some nasty trolls, people don't generally give negative critiques just to be mean. Instead of dismissing what they say—thinking, "He's just a jerk," "She just doesn't know what she's talking about," or "No one else has told me that, so it must not be true"—try to use the critique to improve. The type of criticism will influence whether you should consider revising a current novel or change things for your next book. Grammar and punctuation: if you're getting this criticism often, you should pay an editor to review your book again. Plot and pacing: you should seriously look into this kind of feedback. Writing style: this is probably personal preference and not something you should change. Likableness of characters: depending on how many people complain, you may want to revise. Character development: you should generally look into this kind of feedback. Book cover: depending on who gives the feedback, you may want to invest in a new cover. Formatting: this may or may not be important, but definitely revise if it is easy to do so. Content ratings, such as profanity, intimacy, and violence: this is usually an audience issue. If you are getting a lot of complaints around this kind of content, maybe you should revisit who your target audience is. Consider where the critique is coming from. Is it some random reviewer on Amazon? Those critiques have less value (unless a large portion of reviews are complaining about the same thing). Is it from a family member or friend? Those critiques are worth more, but not extremely valuable if the person does not have actual experience in the field. (For example, if a family member who is not a designer tells you they don't like your book cover, you may want to make some tweaks, but keep in mind that they are not a designer and don't know what will work best.) Is it from an editor who has been trained to improve books? Those critiques are extremely valuable. Is it from a designer or marketing company that tells you your cover or your blurb is simply not up to par? Take those critiques seriously and use them to better your book! But when using critiques to improve, stay true to your creative muse and your unique writing style. Do not respond to negative reviews unless the reviewer has stated things that are factually incorrect and will cause others to view your book in an extremely bad light. Even then, it's better to wait and see if your fans will respond instead of refuting the reviewer yourself. If the reviewer has said something like, "There were so many grammatical errors in this book!" you may want to message them privately and ask if you could get a list of those errors so you can fix them. Readers are usually happy to help, and they may end up altering their review to not be as negative when they see how willing you are to listen. It may be necessary to have someone else respond courteously and point out if they are attacking you instead of posting a review, but nothing is ever achieved by combating with a reviewer. If you're getting a lot of negative reviews, you may want to evaluate if you are reaching the right audience. Should the book be categorized in a different genre? Should a warning or a better description be added to the blurb? Is the price comparable to other books in the genre? See every criticism as a way to improve. The more criticisms you receive, the better you can become! Instead of feeling depressed or frustrated, try to see it as taking one step closer to perfection. Remember that you can always rewrite, and you always have another chance. Criticism can make your story better the next time you revise it or when you write your next book. Keep on writing and don't give up! 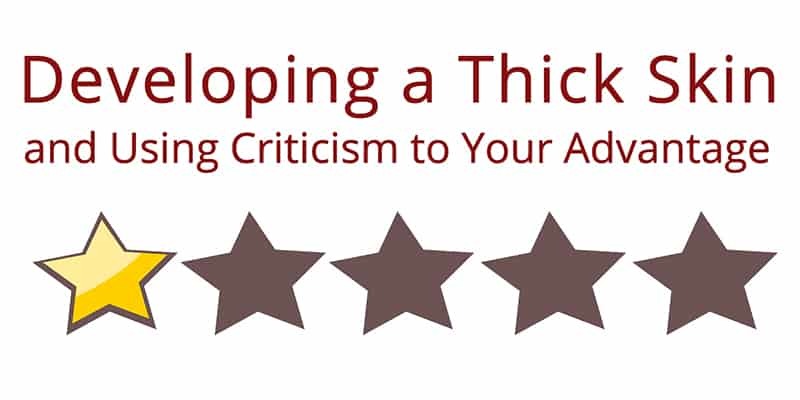 Do you have any tips on developing a thick skin or on handling criticism of your books? We'd love to hear in the comments below. If you'd like to learn more about Book Cave author promotions, please enter your email below and click the "Learn More" button. Do you have a blog idea or topic you know our readers or authors would love? Contact sarah@mybookcave.com to learn how you could get your blog featured.